Golden Star Vintage-Style Jewelry Box | BUDK.com - Knives & Swords At The Lowest Prices! 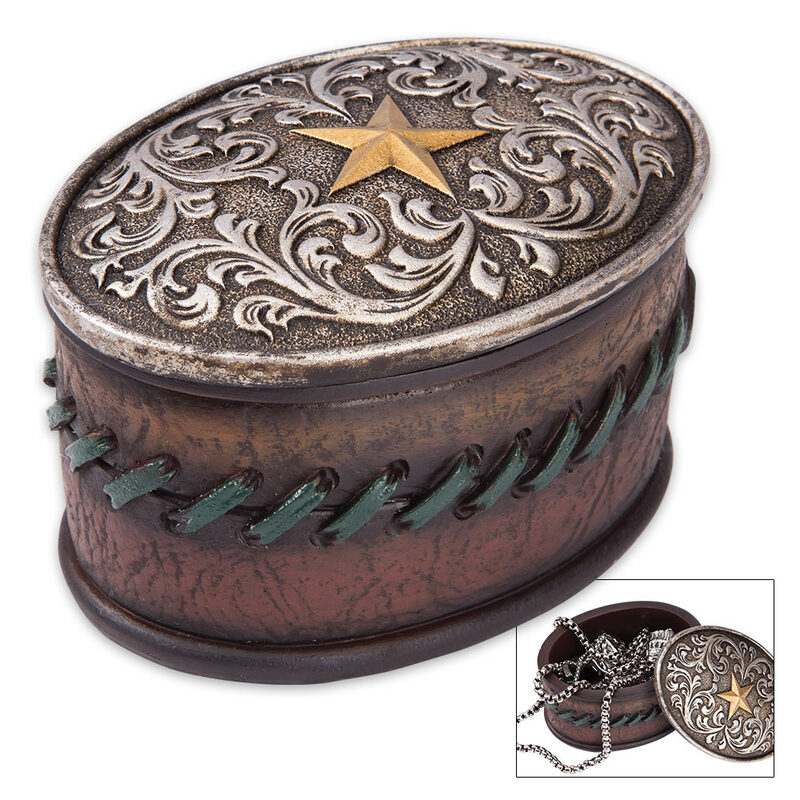 This alluring star-themed jewelry box is beautiful, practical and exceedingly versatile - great for far more than simply stashing rings, necklaces and the like. Impeccably crafted and superbly weathered, it enriches any space with rustic charm and timeless vintage flair. Striking floral relief patterns swirl atop the subtly textured lid, the raised designs highlighted with realistically worn shades of silver and pewter. 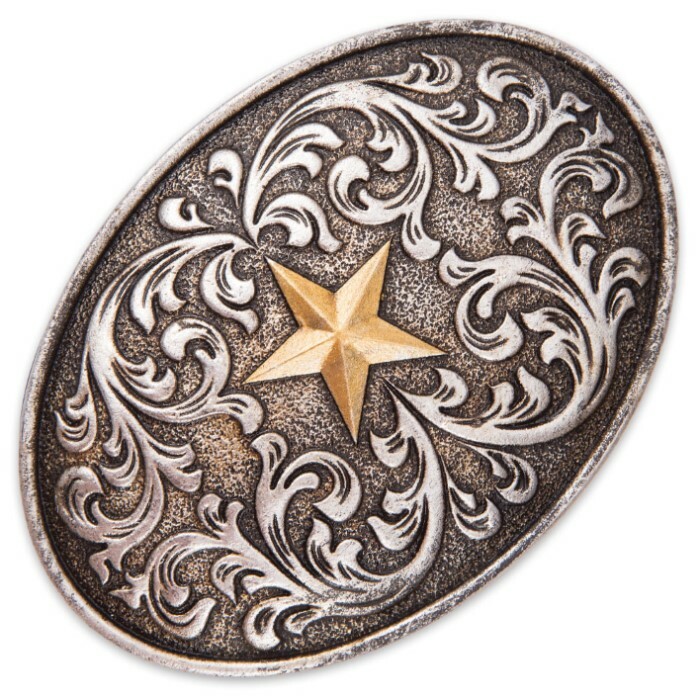 A lone center star affords brilliant contrast, with its warm, antiqued golden hue. 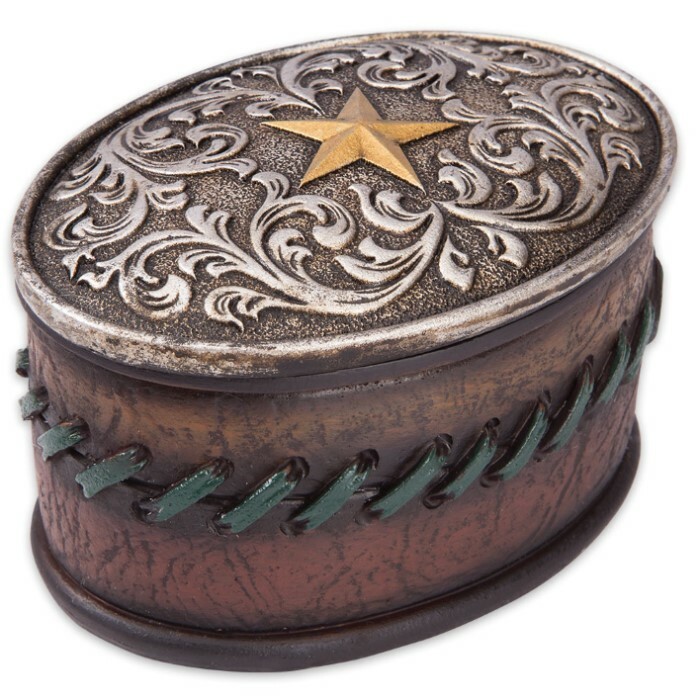 Green simulated leather cord lacing encircles the sides, adding a distinctive finishing touch to this unique elliptical jewelry box. Beyond jewelry, the potential uses are nearly endless. Ditch your unsightly change jar and toss spare coins into this decidedly more attractive alternative. Use it to store medication, lip balm, contact lens accessories and other small bathroom staples, reducing clutter and freeing up space on your vanity. There's really no wrong way to enjoy this all-purpose piece of practical home decor! Made of advanced polyresin, this star-themed jewelry box is stronger and resists moisture damage better than wood and most other traditional materials. It makes an extraordinary gift for any occasion, so get two - one for you and one for a friend or family member. With our unbeatable prices on fine home decor and gifts, you practically can't afford not to!